Cigarette smoke seeps into everything—clothing, furniture, rugs. Now, researchers at the University of California, Riverside, suggest that even this third-hand smoke (THS) can be harmful to our health. In the study, published in Clinical Science, researchers exposed mice to similar levels of smoke found in smokers’ homes. After six months, the mice showed cell damage in their liver and brains. They also had increased cortisol levels, a weakened immune system, and increased insulin resistance (all symptoms affiliated with the development of type 2 diabetes). Lead study author and cell biologist Manuela Martins-Green believes THS exposure is a stealth toxin—a silent killer. We can absorb the toxins through our skin and through breathing without knowing we are exposing ourselves to harm. “Although our research was not done on humans, people should be aware that hotel rooms, cars, and homes that were occupied by smokers are very likely to be contaminated with THS,” said Martins-Green, in a statement. 1. Thirdhand smoke is a relatively new concept, and researchers are still studying its possible dangers. In the meantime, the only way to protect nonsmokers from thirdhand smoke is to create a smoke-free environment. How can we possibly create a smoke-free environment? 2. Have you heard of the “firefly” smokers in Japan? They are the smokers who go into their apartment/condominium balconies to smoke. 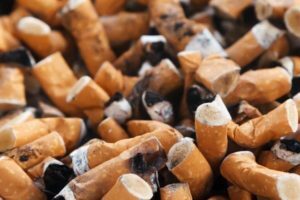 This spring, an organization is asking for stricter regulations against people smoking on their balconies.